A few weeks ago I received a letter from Mr. Paul Goodwin who lived in Vilnius, Lithuania to ask if would Review some of the cables he produced. He informed me about his site that was called Perkune audiophile cables. I admit that I had never heard of Perkune but after hearing the company’s offer, I thought it was worth a try. The Name “Perkune” is obviously the Baltic thundering version of the ancient Slavic god Perunas bałtyjskiego. 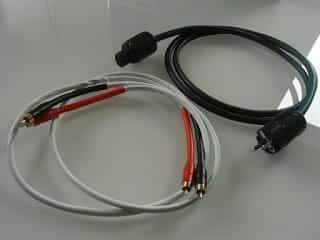 Perkune audiophile cables are a one-man workshop and currently Perkune offers several types of cables. XLR and RCA interconnect speaker cables and power cables. It also has professional cables for guitar amplifiers and guitars. There is also a Vintage range intended for older models of amplifiers and receivers. 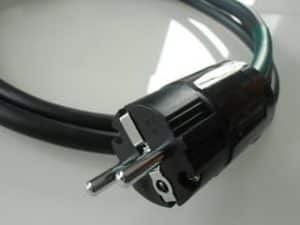 I spent months searching and testing all over the world and finally found a manufacturer in Germany who made the power cord and a manufacturer in Italy who made the Interconnect and loudspeaker cable. I was then ready for the next step which was to ask my friends and colleagues to help me test the cables. The results were far greater than expected and so Perkune audiophile cables began. I received the RCA ‘pro’ 1 m and the power cord ‘pro’ 2 m. The Cables came to me wrapped in a bubble wrap envelope in foil. No boxes, certificates, etc. Traces of the DIY segment but there is nothing to irritate. A carton for a cable is basically superfluous, even renowned American company Cardas Audio are packaged simply in a plastic bag, and AntiCables in vacuum foil. The Perkune cables present a solid decent plug (power is Japanese Oyaide) which are made from reliable materials. The cables are quite flexible and good to hold. The rest you can see from the photographs. The Perkune cables, I can associate with British Tellurium QI. The power cord is made in Germany using OFC and equipped with gold-plated contacts for optimum signal transmission. The cable is marked for polarity. The copper wires – 3 x 2.5 mm2 Resistance: 9.98 ohm / km Capacity: 29 A Cable weight 168 kg / km Test voltage 2 KV The maximum voltage of 500 V Maximum temperature: 150 degrees C. Minimum Temperature: -40 degrees C Flame Spread: CSN EN 60332-1-2 Certificates: HAR, RoHS, REACH. Perkune interconnects are made in Italy, using OFC and equipped with gold-plated RCA plugs. As you read: “Interconnects are transparent, which means that any source gives you exactly what you give to the amplifier, nothing more nothing less, because the resistance is zero, and also the capacity is zero over a length of one meter”. Conductor resistance – 75 Ohm / km Capacitor Core / Core – 55 pF / meter Capacity core / Tarcza- 90 pF / meter Wires – Copper Red (2 x 0.25) 23AWG Insulation – Compact EP Shield 100% coverage of twisted-pair copper Cover: PVC The outer casing: PVC heat shrink wrap. The power cord was connected to the source and amplifiers, phono stages and headsets. The Interconnects I used primarily between Dac and amplifier, phono preamplifier and amplifier. The Perkune cost in Poland is about 800 PLN per pair or in audiophile values are quite reasonably priced and accessible. They are not very cheap, but not expensive and I would say that the cost is just right. Optimal audio cables should not add anything to the sound. The perfect hi-fi cables are those which are transparent, that is one hundred percent and reveal the original sound source to the amplifier. In other words, the perfect hi-fi cables are characterized by the kind of transparency and crystallinity sound. They do not bring anything to the sound, or highlight and accentuate its character. Perkune cables are characterized by unprecedented purity and naturalness of communication, allowing you to explore the sound completely. Nuances and details coming in for example from a source (DAC Audio Analogue Vivace) are reported accurately and fairly, have adequate selectivity grain and are clear and unambiguous. They have a real dimension, are drawn on a truly black background. During the listening sessions from FLAC 16-bit / 44.1 kHz (Various Artists, Linn Records Sampler), you find resonance, richness and radiance of instruments, high selectivity recordings, and even a little to expose the metallicity, paid by trumpets and saxophones. You clearly feel the different nuances and details, allowing you to enjoy a complete sound. Important to note that Perkune is famously suited for the headphone system. They provide a full and saturated sound of prime tonal diversity. The sound is deliciously direct, fresh and reliable. The cables are bright and lighted, have no analogue mists, do not rub any signal bloom, do not introduce distance. The cables have no excessive aggression and are balanced and Holographic. This is my conclusion of the Review of Perkune audiophile cables. The application may be only one. Perkune cables cost relatively little and will bring a lot of positives to a sound system. They are transparent and universal. They bring the sound of squeaky clean. It is worth to listen to them because you may well want to have them! Perkune Interconnects 2 x 1 meter – price EU 295 (including delivery). I am getting experience daily by reading thes nice posts. I remember a time when quadrophonic sound was being explored, and then, I remember everyone moving back to stereo! When asked, the users would say, the sound just wasn’t clean…. Reading this review, I’m sure this technology for a meditative sound experience could be taken up again, now that we have such quality, pure – sound cables! Quad sound – I actually thought it was brilliant and loved what they did! I had a great sounding system but had to go when I got divorced!